... thanks Ghanaians for support. 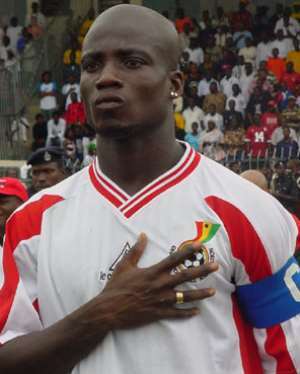 The skipper of the senior national team, Black Stars Stephen 'Tornado' Appiah has descrided yesterday's thumbing of Bafana Bafana as a clear indication of the team's resolve to respond to the roll-call in Germany 2006. The combative offensive midfield generalissimo was full of praise for his colleagues for exhibiting great sense of unity and nationalism, which he believes, was a key in the success story of the team yesterday. “There is absolute peace and unity in the camp and every single player was prepared to die for the country”, he pointed. He found it very difficult to single out any individual player as the man of the match not even himself, a two-goal hero, describing the performance as a collective one. He added that if there is anyone who deserves a special mention for putting up outstanding performance, Coach Mariano Barreto stands out taller than anyone. The skipper who scored two goals himself made these observations in an exclusive interview with SPACE FM, after the team had annihilated South Africa 3-0 in a world cup qualifier played at Kumasi Sports Stadium on Sunday. Appiah denied with vehemence the notion in town that the team's sterling performance is tied with extrinsic motivation in the form of enhanced bonuses, allowances and per diem. “How would the players be interested in material reward when nobody even bothered to find out per diem and allowances before the match”, he queried. The three goals banged in were enough to propel the team to the top of group two on superior goal difference. The other teams in the group, Uganda, DR. Congo, Cape Verde, Burkina Faso, and South Africa all have three points. Appiah also thanked the fans for the support before, during and after the big match. “We prefer a situation where supporters would be few but would cheer till the last blast of the whistle than a pack-to- capacity stadium but silent fans”, he told Space FM. The battle line is drawn, the show has just begun! Who makes it to Germany?